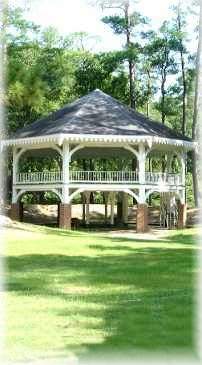 Once a Choctaw Indian village, Abita Spring is now widely recognized for its attractive historic district, shaded sidewalks, friendly restaurants, antique shops, art galleries, country stores, and a quaint folk art museum. Bike riders, walkers, joggers, skaters, and horse back riders make use of the popular Tammany Trace that passes through the center of this small town. Lodging can be found in local B&Bs and area motels. Historic Abita Springs is north of Lake Ponchartrain in the New Orleans North shore area. The UCM Museum is north of New Orleans in historic Abita Springs. This roadside attraction features a vintage service station, a 90yr old Louisiana Creole cottage, an exhibition hall of memorabilia, and the much photographed House of Shards. The boardwalk is approximately 1200 feet long and provides daytime viewing of special wetland habitat types such as scenic longleaf pine savanna and bayhead swamp. Trail and boardwalk combined is 0.7 miles long. The habitat types present support numerous rare and uncommon species of animals and plants, such as the yellow pitcher plant, a carnivorous or bug-eating plant, for which the trail is named. This is a free and really fun thing to do with children. A new and very nice golf community about a mile from the UCM. This place is so big that they have set aside land for their own schools. It used to be a Tung tree farm. The golf course is new and well maintained. Longbranch A very nice restaurant in an old two story house in Abita Springs. There is ample space under the pines for your limo. Tammany Trace The 31 mile bikeway that runs next to the UCM. This used to be the old railroad tracks and they were converted to a paved trail for bikes, hikers, and horses, It goes from Covington to Slidell. You can rent bikes at the UCM, and other places in Abita Springs. The Trace is one of the biggest attractions in our Parish. It's patrolled by special rangers who tell me that they have seen foxes, deer, wild turkeys, swamp rabbits, rattle snakes, water moccasins and other wild animals on the path. In the 31 miles of the trace, there are also 31 bridges. A popular brewery and a brew pub. Abita Beer is sold all over the U.S. now. The brewery offers free tours and are 5 minutes from the UCM. Old time county music only 1 block from the UCM Museum. A real Louisiana roots version of Austin City Limits production. Come see, exhibit, and ride homebuilt, vintage and custom bicycles. All bicycles types were welcome - yes you can bring your new mountain bike, your new or old racing bike, or the bicycle your grandfather has in is garage. This is a free festival on the Saturday before Father's Day in Abita Springs in late June. Each year during the Mardi Gras season our parade wanders through Historic Abita Springs. The date of the parade is usually on a Saturday nine days before Mardi Gras Day. It rolls a one mile route in sunlight at 11am. A B+B with the slogan "A Quiet Place To Be." About 10 minutes from the UCM. Abita Springs is an old resort town and you can see some great old pictures at this site. Here are some recent photos of Abita Springs and the surrounding area. There is a nice short history of the town at this site. Abita used to be a popular tourist spot 100 years ago. When the first settlers came here, there were about 25 Indian families living in Abita Springs. Eventually many of them were escorted to Oklahoma. Art Jewelry studio in Abita Springs.